BIG SALE!! 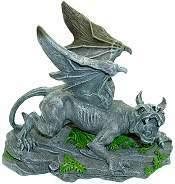 Gargoyle Figurines & Statuary $12.95+ BIG SALE!! 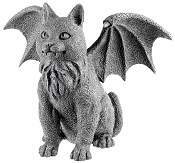 A charming Cat Gargoyle seems to smile sweetly. These superb Gargoyle figurines have the aged, weathered verdigris look of old stone artifacts that lend interest to any decor. Hand painted cold cast resin figure packed in glossy black gift box. A large open winged ram horned Devil Gargoyle savors his last dirty deed. 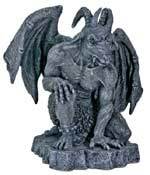 These superb Gargoyle figurines have the aged, weathered look of old stone artifacts that lend interest to any decor. Hand painted cold cast resin figure packed in glossy black gift box. 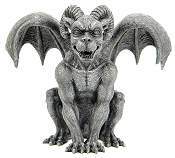 The Guardian Gargoyle has a fierce gaze and a dark grey stone appearance. 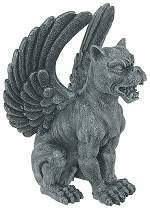 This ever watchful gargoyle has superb detail with a snarl and a firm stance to ward off any would be intruders. Hand painted cold cast resin figure packed in glossy black gift box. 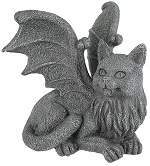 7 1/4" H x 5" x 5 1/2"
A happy Cat Gargoyle shelf topper will add some myth and magic to your day. These superb Gargoyle figurines have the aged, weathered grey look of old stone artifacts that lend interest to any decor. Hand painted cold cast resin figure packed in glossy black gift box. A long haired open Winged Wolf Gargoyle is chained to his post so he can't fly off. These superb Gargoyle figurines have the aged, weathered verdigris look of old stone artifacts that lend interest to any decor. Hand painted cold cast resin figure packed in glossy black gift box. A large open winged Griffin Gargoyle keeps the evil eye and bad fortune at the door. 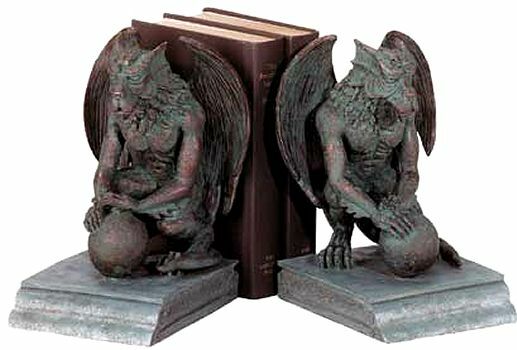 These superb Gargoyle figurines have the aged, weathered look of old stone artifacts that lend interest to any decor. Hand painted cold cast resin figure packed in glossy black gift box. A tiger like Winged Beast Gargoyle is growling at his intended prey. These superb Gargoyle figurines have the aged, weathered verdigris look of old stone artifacts that lend interest to any decor. Hand painted cold cast resin figure packed in glossy black gift box.